View of Sweatheart Abbey. The abbey is situated in the village of New Abbey, near where the River Nith flows into the Solway Firth, about five miles from Dumfries in Scotland. In the 13th century this would have been a remote and tranquil spot, ideal for a community of Cistercian monks who lived lives of contemplation and prayer. The abbey was originally built in red sandstone in the ‘English’ style with the monastery's first abbot, Henry, overseeing most of the construction. The church measured 203 feet in length with a central tower 92 feet high, there was a nave with aisles, transepts with chapels on their eastern sides, and a choir. A large part of the monastery was rebuilt in the 14th century after fire caused considerable damage. 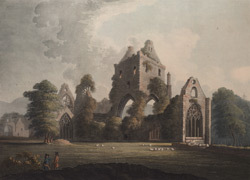 The Abbey was named in memory of Lady Devorgilla’s love for her husband John Ballioli.